My little vegan family is so fortunate to have extended family that support our vegan lifestyle. I know that this time a year getting together with family for holiday meals can be a source of stress, especially when so much of the gatherings focus on food. Too often, non vegan food. Our recent gathering was stress free. Vegan food was the only option. The meal making responsibilities were mostly split between my mom and I. Hubby pitched in and made a pumpkin pie using Isa Chandra’s recipe, out of fresh pumpkin and chai as a substitute for the soy milk. I made scalloped potatoes, a nut loaf, and asparagus salad. My mom made spätzle, gravy, a pecan pie, and this delicious salad. Toss ingredients together in a large bowl. Place on baking pan. Bake for 20-25 minutes until tender, stirring once while baking. Let cool. You can bake at 350 degrees, spread out on a cookie sheet for 5-10 minutes until golden brown, stirring occasionally. Or, cook in a dry non stick skillet, and heat over low heat, stirring occasionally until golden brown. Gallery | This entry was posted in Salad. Bookmark the permalink. How delicious is this! 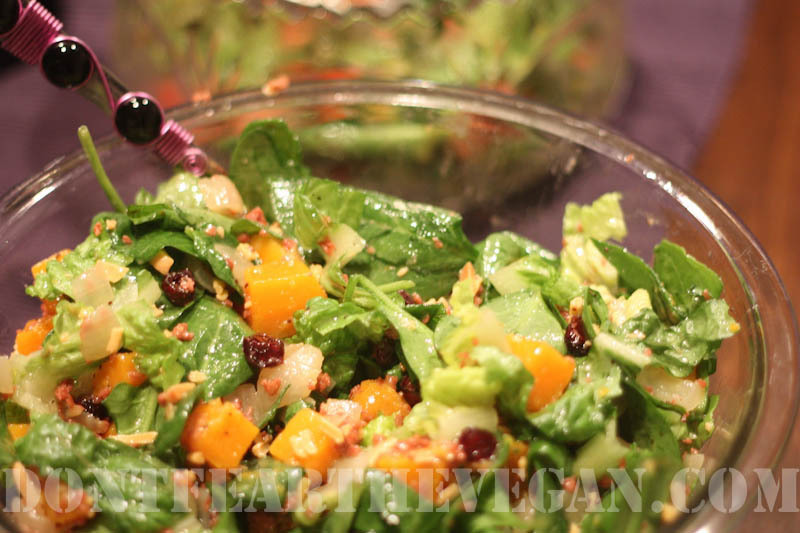 Love the addition of vegan cheddar cheese – it will make it so savory-sweet-delicious!